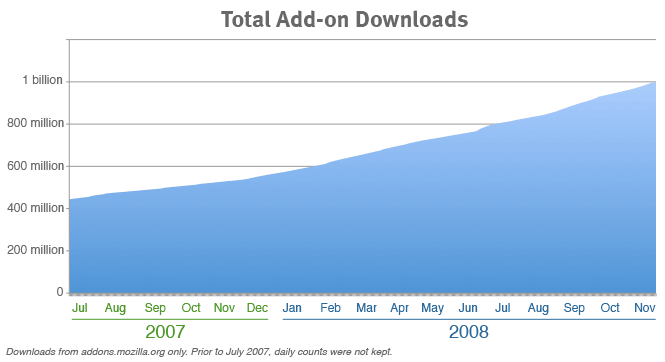 This morning, addons.mozilla.org reached a huge milestone: we served our 1 billionth add-on download since we started keeping track of downloads in 2005. This number only includes downloads from addons.mozilla.org, but as many add-ons are hosted elsewhere, we can be sure the actual number is even higher. This is a very exciting week for Firefox add-ons, with the launch of Fashion Your Firefox yesterday, offering a new way for first-time add-on users to customize their browser. This amazing feat was made possible by the huge community of add-on users, developers, and enthusiasts, as well as non-Firefox applications that embrace Mozilla add-ons like Thunderbird, SeaMonkey, Sunbird, Komodo, Flock, and Songbird, to name a few. At 1.5 million add-on downloads per day and increasing, I’m confident our next billion will arrive even more quickly than the 3.5 years it took for the first. If you’re not using an add-on yet, try one out. They’re pretty popular. what extension had the billionth download?!! What an awesome milestone – very cool indeed. I think the awareness of addons is spreading down the foodchain, from geeks to more normal 😉 people. Download Helper is by far the best add on for anything..ever. You guys need to advertise that more, it’s flawless. Firefox ftw. Does that include every time I update an add-on? Because every release of firefox inevitably breaks a bunch of plug-ins, meaning the authors have to make a trivial update to them just so they’ll keep working, meaning they get re-downloaded. Congratulations on 1 Billion served! I guess I’m one of the billion, but will have to ask my son. Cool, but what exactly is an add-on? only extensions? extension and themes? extension, themes, plugins and search plugins? Addons are useful for all techie…Download Helper is also good add on for anything..